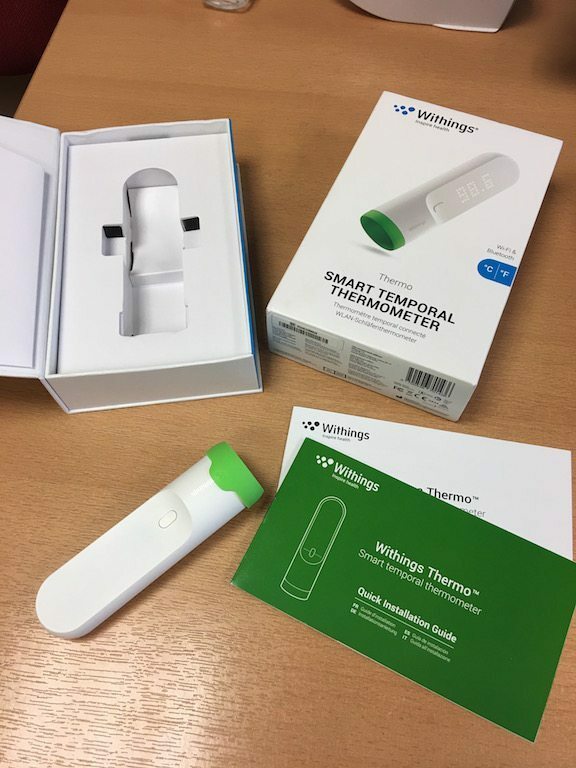 The Withings Thermo, a smart thermometer, has been released just in time for the cold and flu season in the UK. 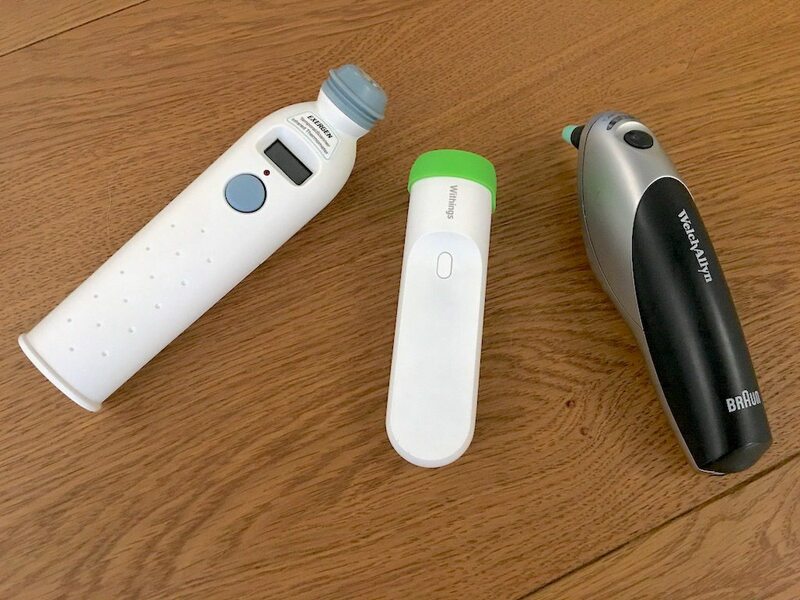 I’ve been testing it out to see how their temporal artery scanning tech, compares with my NHS issue Braun ThermoScan in-ear thermometer. 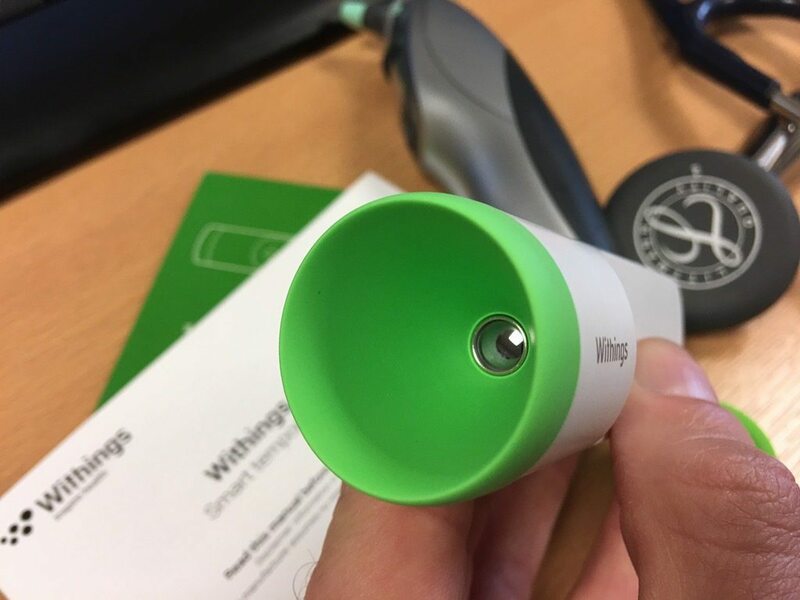 So have I a got a new toy in the doctor’s bag, or should Withings go back to the drawing board? 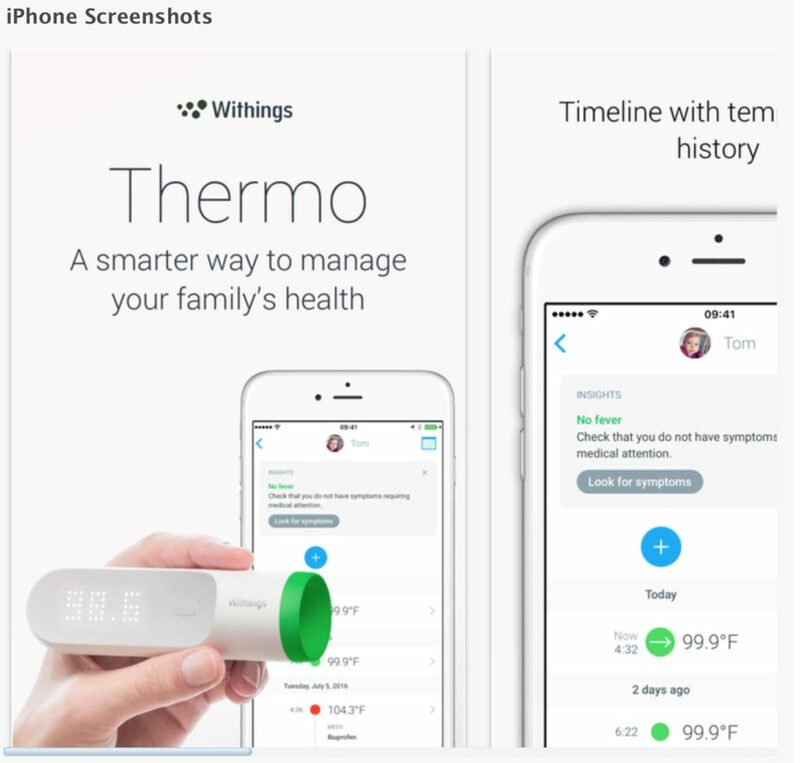 I say monitoring another person’s temperature rather than your own, as being a temporal scanning thermometer, there is a bit of a knack to using the Withings Thermo. 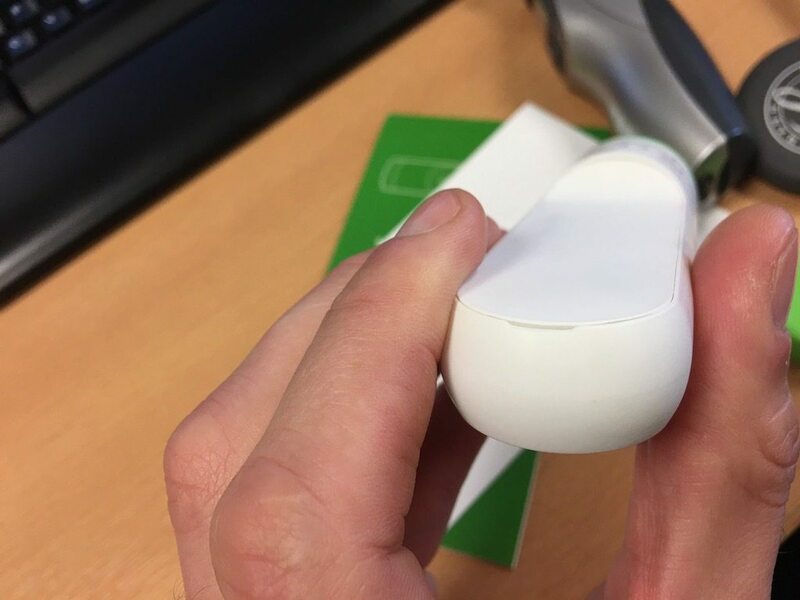 With an in-ear thermometer, it’s essentially just a case of pushing the probe into the hole and wait for the beep. 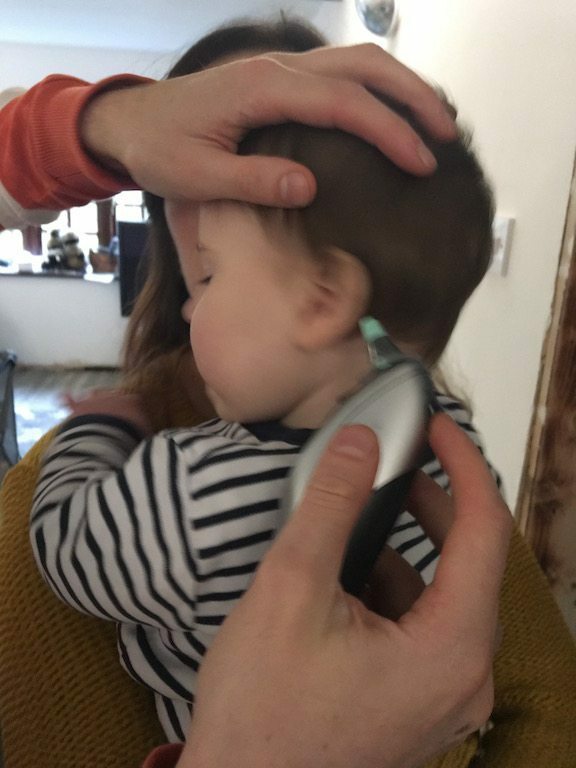 However, with a temporal scanning thermometer, you need to follow a smooth arc around the forehead. 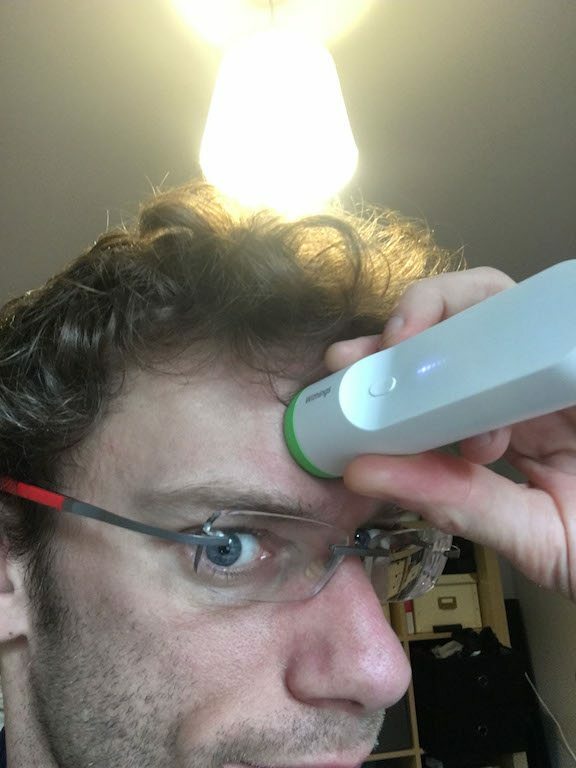 Doing so on someone else isn’t that difficult, but monitoring your own temperature with the Thermo isn’t that easy – a mirror is definitely needed! At the green, business end of the Thermo is the HotSpot sensor. 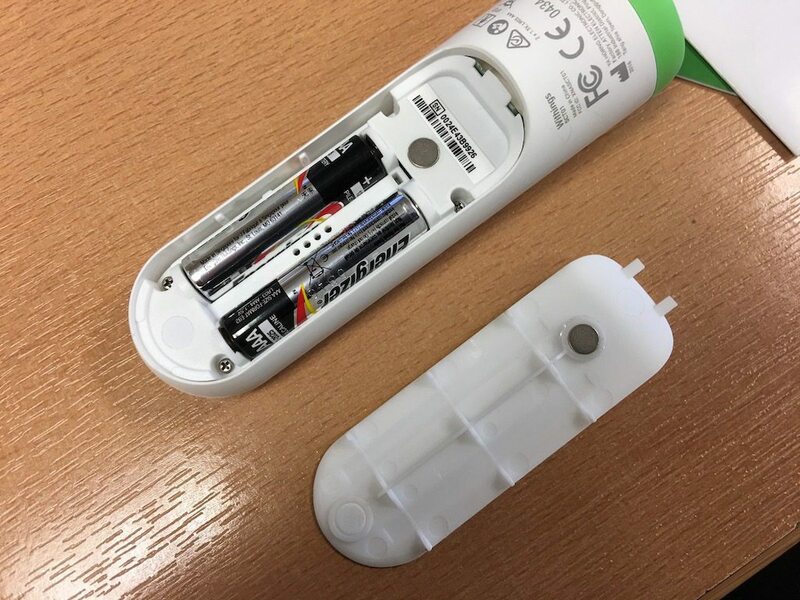 We have the rubber cover, and a green rubber ending around the top of the unit, with the sensor recessed underneath. But I wonder what would happen if you did get something on it? How well would it work after cleaning? 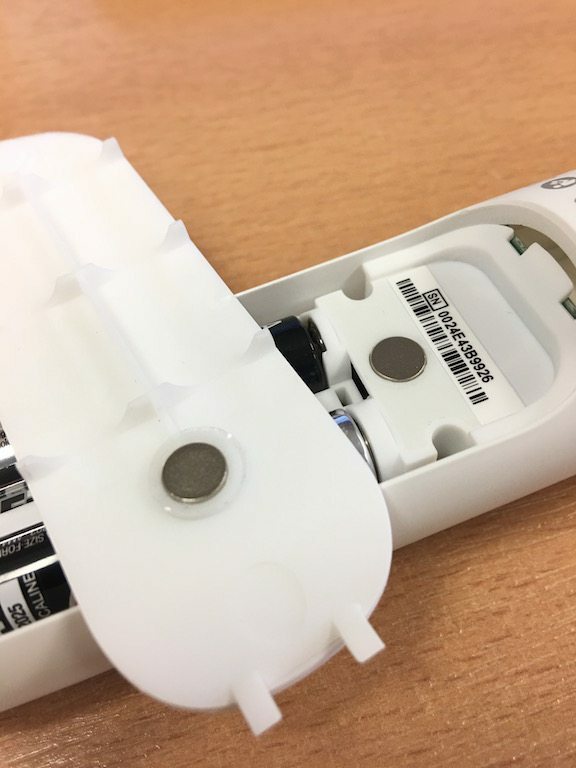 NO USB power here, on the other side of the unit is the battery cover, with two AAA’s nestled inside. Does it matter where you measure? 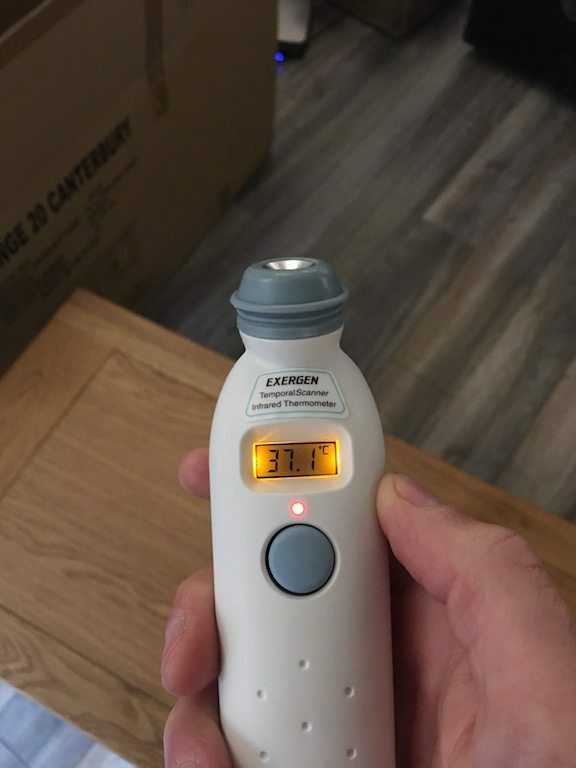 I think before we go any further it might be worthwhile looking at what a “temporal scanning thermometer” is, and how it differs from other thermometers on the market. 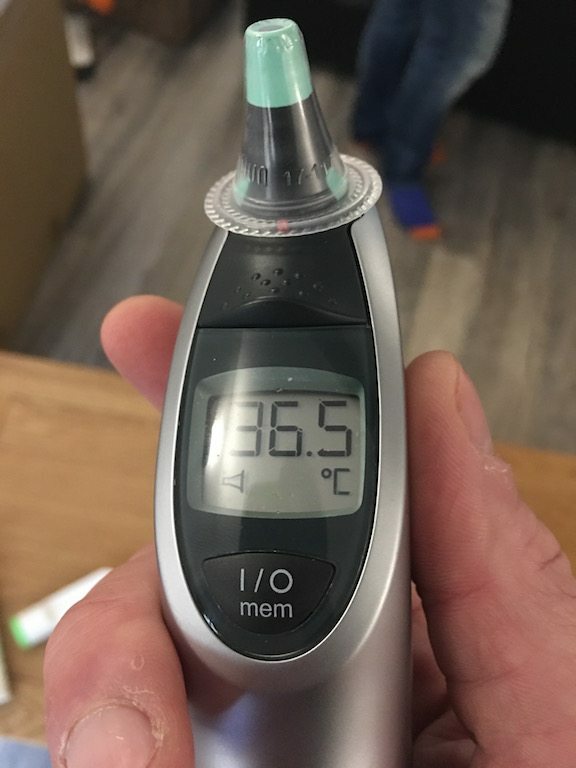 So what makes this type of thermometer so special? How is it better than the classical mercury thermometers that would just be stuck under the tongue “in days of yore”? 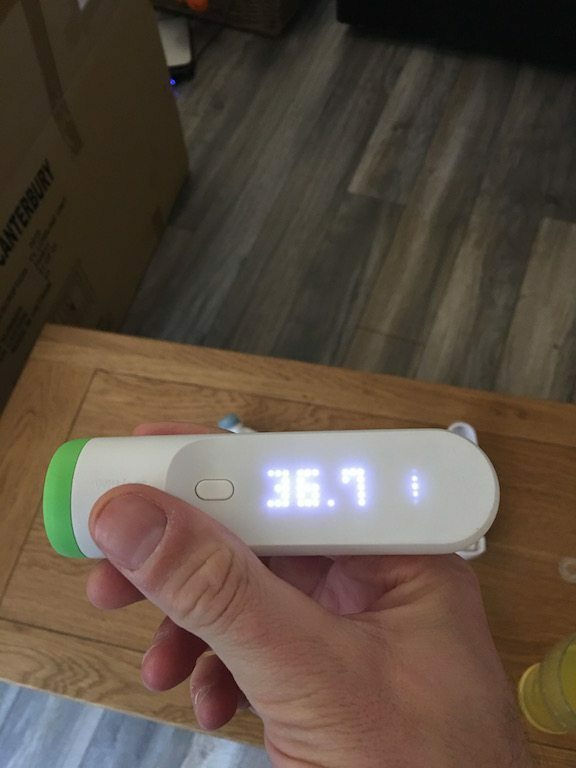 – Well, for one thing, you’ve not got the increased chance of mercury poisoning if a child decides to bite into either a temporal scanning, or in-ear thermometer, but that also stands for many thermometers today! There are many different places to measure the bodies temperature, but from a medical perspective, we’re interested in is what a bodies CORE temperature is. There are other locations that temp can be checked, but they are not going to be routine locations and not something a normal person would measure at home, we’re talking things like direct monitoring occurring in ITU. Mouth – a thermometer here needs to go as far back under the left and right side of the tongue as possible. – IDEALLY not have eaten or drunk for 30mins, and of note is not considered to be accurate when is used to measure the temps of under 5yrs – as it must remain under the tongue, with the mouth closed for 3-4 mins – Have you SEEN how much children <5yrs squirm?!!! 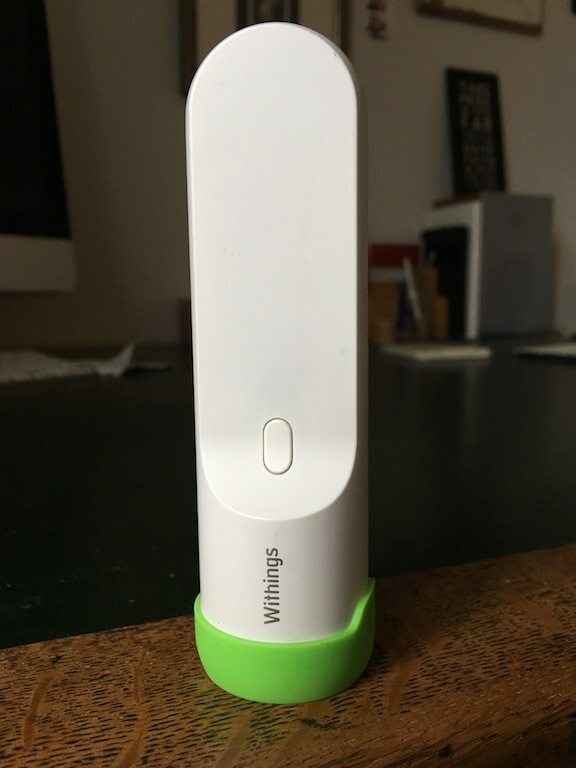 The Withings Thermo is a smart device, thus it talks to your phone. Thankfully this is not an absolute requirement. 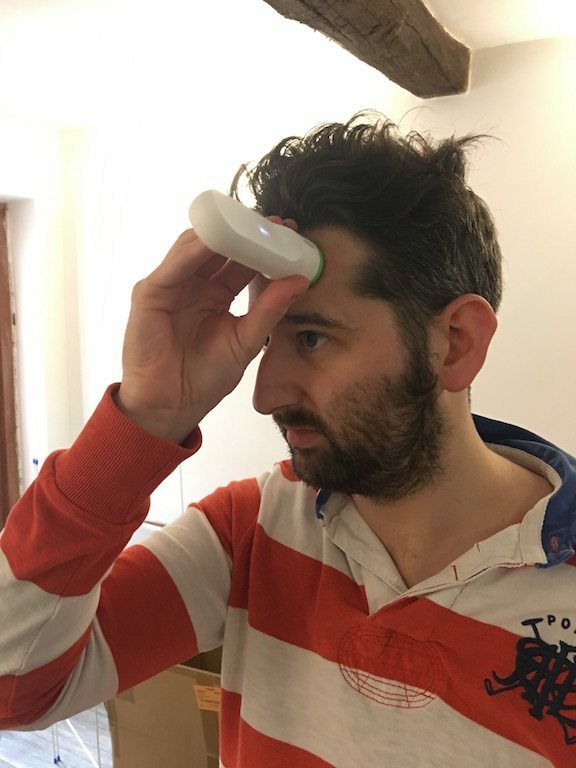 You can still run it around someone’s forehead and get a temperature with the device. 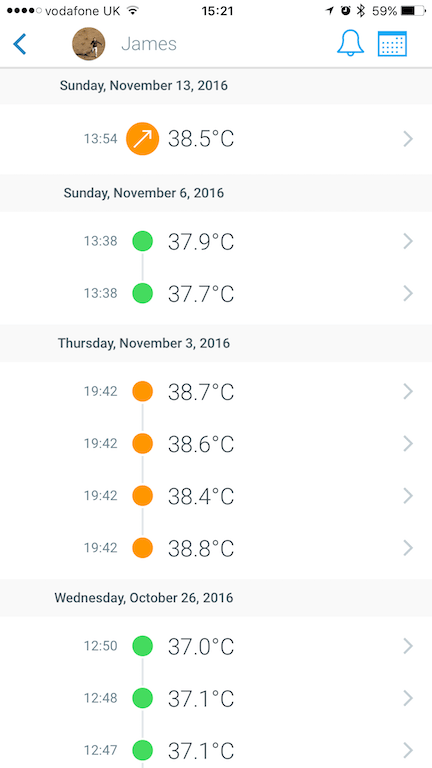 From a medical perspective, the app encourages you to give you a little more detail, which can be inputted when you click on a particular temperature reading. OK here comes the science – Part 2! But there have been a lot of changes to technology since 2011. Unfortunately, a 2015 paper had an even more damning conclusion“Peripheral thermometers do not have clinically acceptable accuracy and should not be used when accurate measurement of body temperature will influence clinical decisions“, OR SO IT SEEMED! 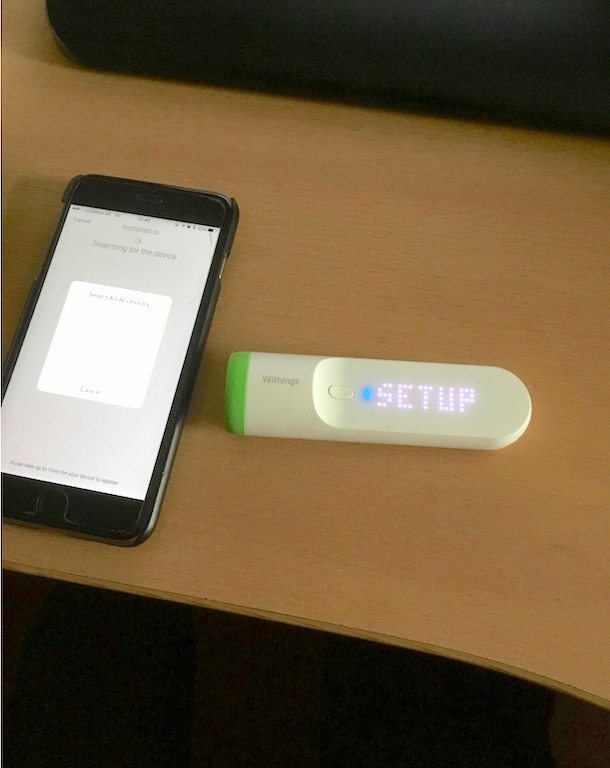 Here is a major problem with medical devices and journal articles, it is often not difficult to massage wording to reach the conclusion you want – I refer you to Withings picture above. In the case of the 2015 article, they are not speaking specifically about temporal scanning thermometers, but ALL peripheral thermometers. Which is a statement that also includes the Braun ThermoScan, used across the NHS! 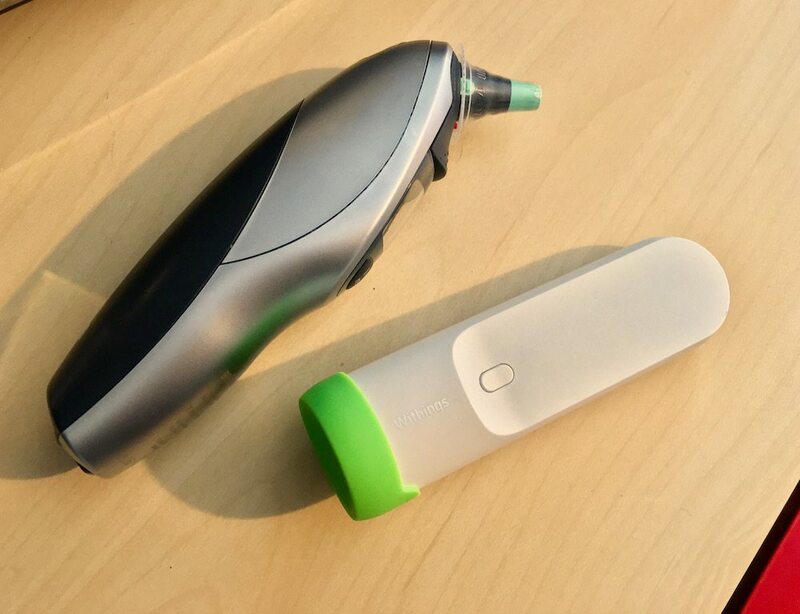 TO clarify that point, they are both inaccurate from an ITU, clinically vital perspective, but for use at home, and in the GP’s bag as an indication of patients approximate condition, they are ok. SO heavy science out of the way, what did I find? As mentioned previously, in-ear thermometers don’t play nicely with children, or should that be that children don’t place nicely with them. 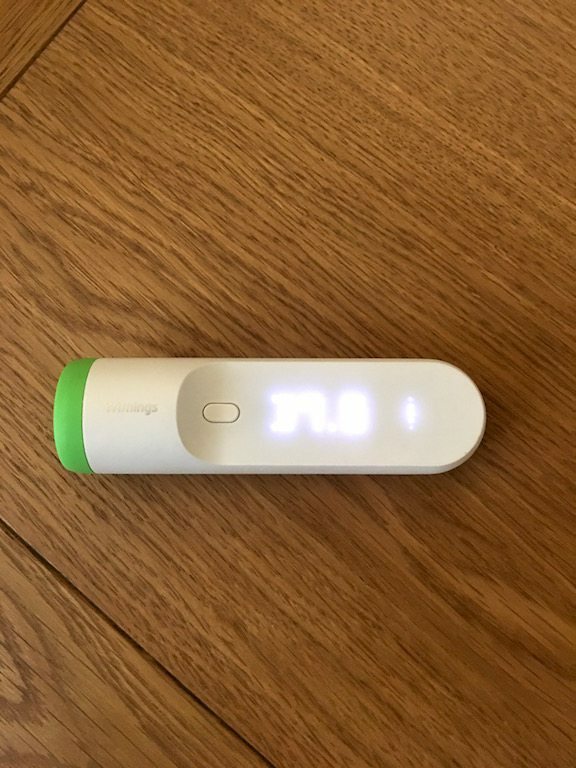 While in practice, with Withings Thermo, has made my life easier taking temperatures, patients obviously don’t want photos of their child, at the GP surgery, looking unwell on the net. Given my best friend has recently had a child, well his wife anyway, I had the perfect tester and photographic subject! 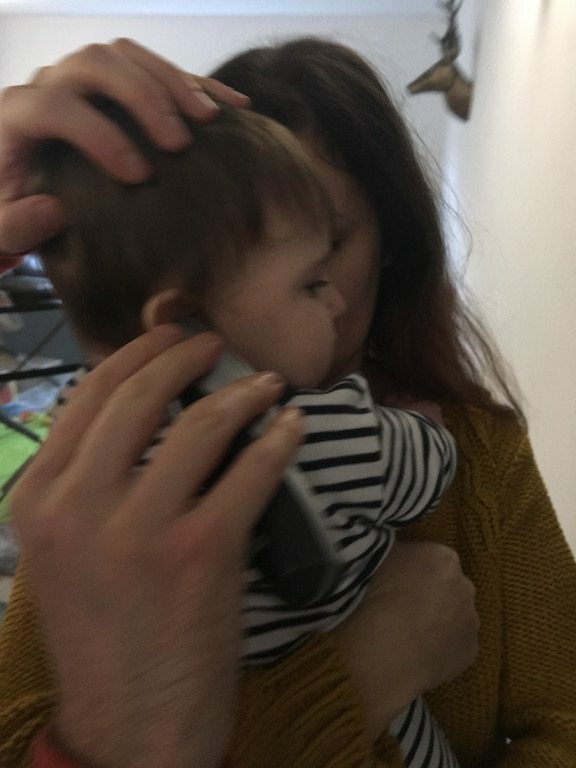 NO not him – the baby!!! Although my friend is also a GP, so was actually happy to help with the review. 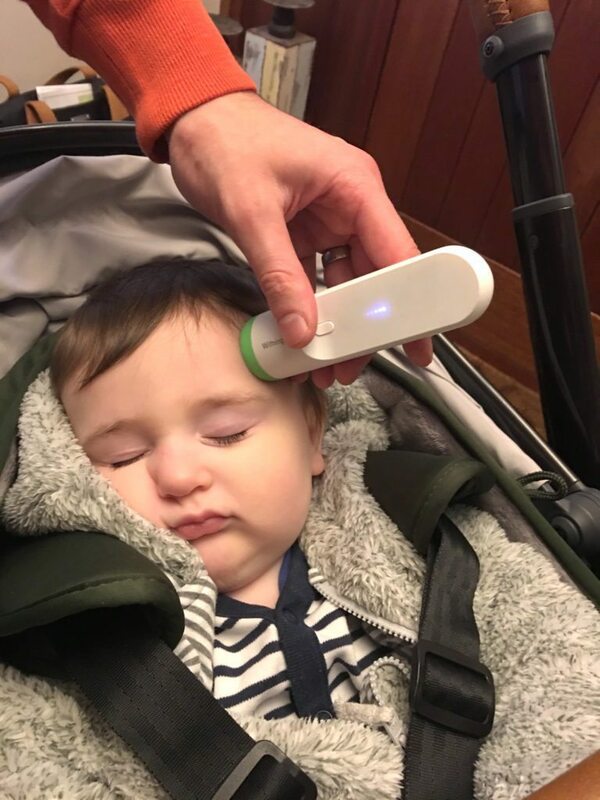 Here is the real benefit for a doctor or a parent a temporal scanning thermometer, the child really isn’t affected by the temperature being taken, you can literally do it whilst they are sleeping. Starting in the centre of the forehead, and drawing slowly towards the hair line. It’s important that the sweep takes about three secs in order to allow enough data, and not hit the hair line too quickly. I have found myself repeating a result, as I’ve not been happy with how quickly the unit has reported a temp, and it’s usual settled on the second and third scans when I have taken the whole three secs to get around. As mentioned before, in-ear thermometers can cause a bit of a problem, both in terms of child discomfort, but also accuracy is affected below aged 2. After the baby challenge, what did we get? As you can see, not a huge amount of variation, 0.6 degrees. But from use in the practice, I have seen up to 1 deg measurement variable both ways when using the Braun and the Thermo. 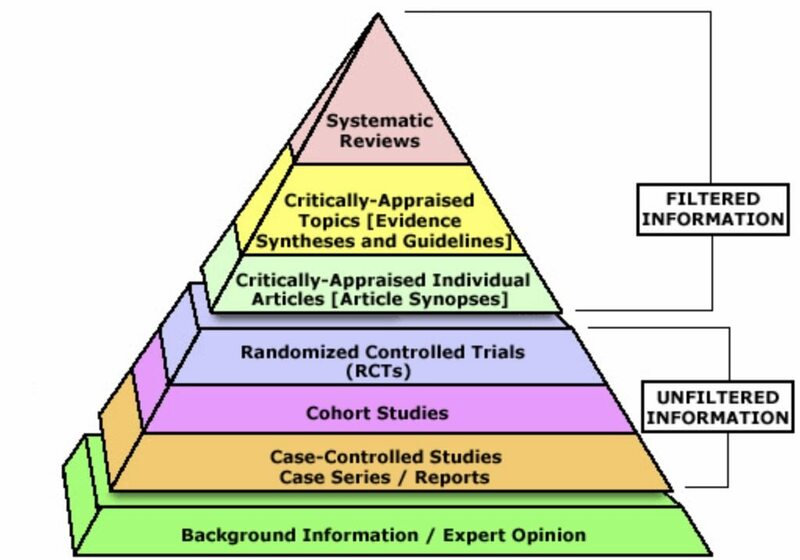 From a medical perspective, I am not going to act purely on the basis of a temperature, but put things in the overall clinical context. This is sometimes while you’ll send patients down to the A&E department, or along for further investigations based on a hunch. As we’ve seen, no indirect thermometer is accurate enough to base the entirety of a medical management plan, but they can be used to get a “feel” for what is going on. What about that FDA approval though? 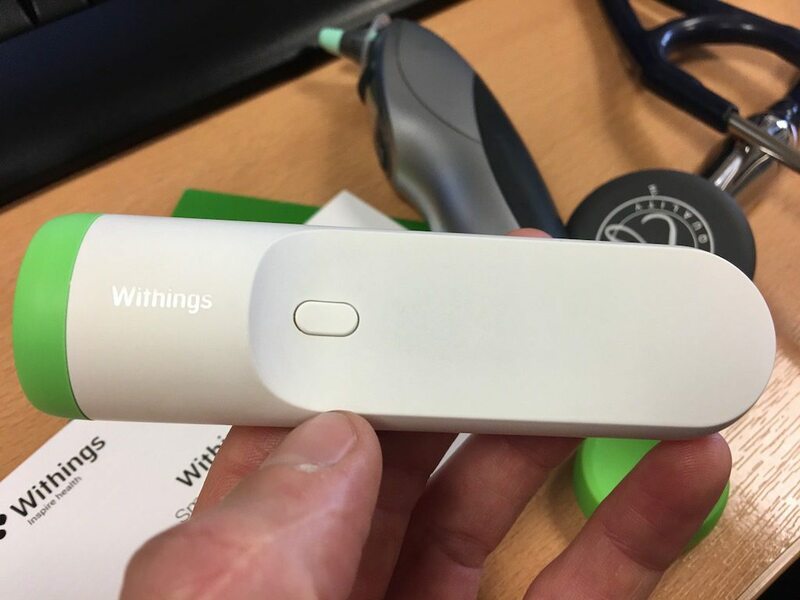 HOWEVER this is a very imported distinction from FDA approved, and the above from Withings site might be considered slightly misleading – so the first question is, what’s the difference? Ok, anyone else’s eyes cross over with that?? So we know what the DIFFERENCE between those two statements is, but what does it actually MEAN? Basically that the Thermo is as effective as other temporal scanning thermometers on the market, which we’ve already seen isn’t the gold standard. Conversely, the FDA is saying it is not worse than anything else on the market. 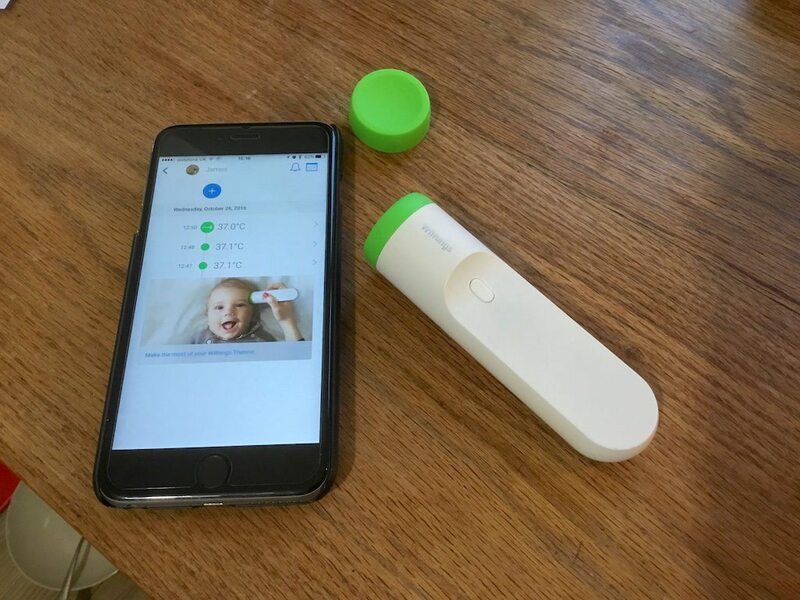 The ease of checking a child’s temperature is greatly improved with a temporal scanning device like the Withings Thermo, and a child who is being monitored well is likely going to have a fever picked up sooner than a child with fewer measurements, due to the battle that checking an in ear temperature can be. On the device side of things, one thing I didn’t like is the white material; it tends to pick up marks very quickly in the bag. However, that may also be a good design feature, encouraging me to clean and disinfect it more often! Overall the Withings isn’t cheap, which might be it’s the biggest issue. The inclusion of the app might also be considered an excess engineering step. 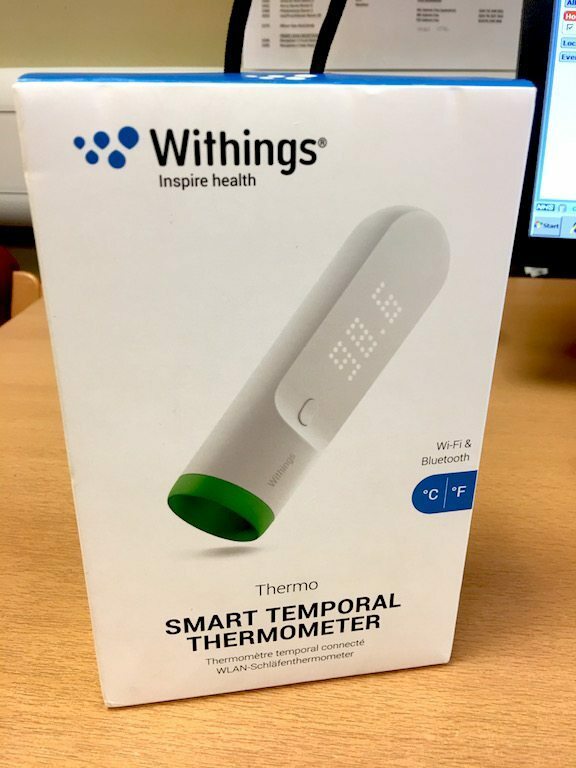 BUT if your little one is unwell, then I think a temporal scanning thermometer can be quite a useful aid, but only if you can afford it – remember this is likely a device to remain in a cupboard, unused for most of the year! 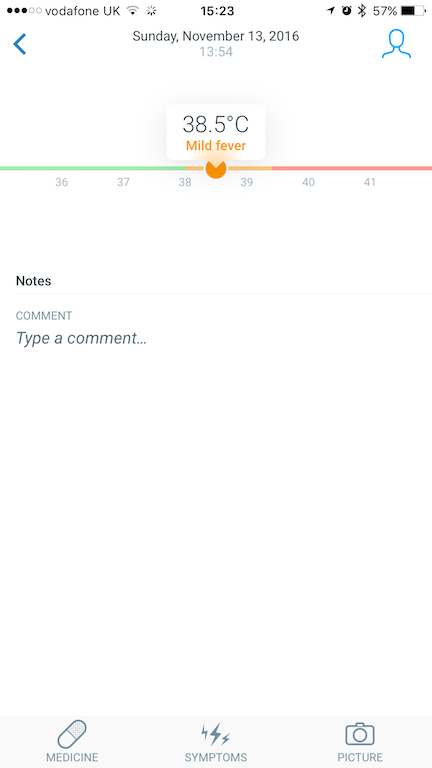 Zwift iOS Game App review – Full Zwift in your pocket! !